Photographs from the Portnoy Collection at the Hockey Hall of Fame. Firefly Books (1998). 165 pages. Although I'm an avid reader, particularly of hockey books, I must confess that I usually tend to shy away from large, "coffee-table" books that contain more photographs than stories. Not that I have anything against the art of sports photography, particularly those who cover the NHL, but I generally find these books devoid of any real interest. To me, they seem to pander more to those with short attention spans who'd rather look at the pretty pictures rather than read the stories behind the subjects in the photos. Shoot Stars, by Andrew Podnieks, is a rare exception. As the sub-title explains, it covers the work of hockey and sports photographer Lewis Portnoy, who covered the St. Louis Blues throughout the 1970s and early 1980s. What set Portnoy; work apart from the standard work of hockey photographers in the 1970s was his use of techniques which were unusual for the time period, but which captured the game in a way never seen before. He used strobe lights, zoom lenses and had holes cut in certain spots in the Plexiglas to capture his subjects in action. The result were photographs that were not only unique, but also stunningly beautiful and incredibly detailed, capturing the "violent ballet" that hockey truly is. Portnoy did shoot standard "head and shoulder shots" of his subjects, which were popular at the time. What stands out about them is the clarity of the photographs. His work could at times bring the fan seemingly within reach of the players. However, what interested me the most about his work was his action shots around the net, with several players captured in one frame. It is here that Portnoy's work truly defines the expression "so close to the action, you'll feel a part of it". It's as if he were on the ice as a player observing the game, rather than a photographer trying to catch the moment. Through these photos, the fans can feel as though they're part of the action, as well as get a feel for the spirit of the moment. There is another reason why I enjoyed Portnoy's work, and why this book is so special for me. I grew up watching the teams and players of the NHL of the 1970s. These photographs captured the spirit of those times so vividly for me, when NHL players were larger than life to a boy growing up in rural Nova Scotia, and thousands of other youngsters like myself at the time. There is Gordie Howe in his final season as a Red Wing, wiping his brow and looking younger than I remembered him. There he is ten years later, in his final NHL season in 1981 at the age of 52, leaping over a sprawling opponent with the nimbleness of a man half his age. There is Gerry Cheevers of the Bruins, preparing to put on his famous "stitch" mask prior to the start of a game. A photo of now-Flyers GM Bob Clarke, back when he was then-alternate Flyers Captain Bobby Clarke, with his "face like a choirboy and his smile like the Devil". Gump Worsley, sans face mask in the early seventies with the Minnesota North Stars, making a save, his unprotected face showing the effort that no one sees of goaltenders behind their plastic and wire cage masks. There are also very interesting shots of average players whose names may not be familiar to today's hockey fans, but to those like myself who followed the game over twenty years ago, they were as commonplace as the "muckers and grinders" of today. Curt Bennent of the Atlanta Flames in a pensive moment during a break in the action. Henry Boucha of the Colorado Rockies with his trademark headband. Doug Favell of the Philadelphia Flyers and his "sunburst" goalie mask. Blues forward Chuck Lefley in full flight, racing past three Sabres defenders and looking all the world like Guy Lafleur, but with a moustache. The Boston Bruins Tazmanian Devil, Terry O'Reilley, cartwheeling through the air after a vicious check. And most intersting of all, much-travelled forward Glen Sather, with the Blues when the photo was shot, trying to battle past a Kings defenceman, his days as the builder of the Edmonton Oilers dynasty still far ahead in the future. Another aspect that will thrill those who were fans of the game in the 1970s is the number of photographs showing players wearing the sweaters of teams long since gone or having changed their logos styles . For me, it was a real hoot to once again see see goaltender Dunc Wilson wearing the first Vancouver Canucks jersey with "the classic logo" (which is still the best of the three logos the Canucks have had in their history). Or Mike Marsden with the original Washington Capitals jersey. Another enjoyable one is a photo of a scrum around the Blues net with Pittburgh Penguins players, with the Pens wearing those awful blue and white uniforms with the hockey playing Penguin logo in the middle. Sometimes change can be for the best! Then there's shots of players from the Cleveland Barons, Kansas City Scouts and California Golden Seals! I chuckled in delight when I saw those! 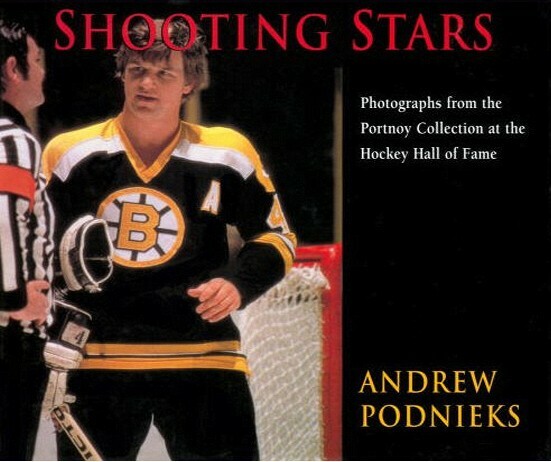 Podnieks does a fine job of providing interesting narrative to each photograph, giving the shots an added dimension one might not have gleaned. A first glance of a shot of Derek Sanderson in a Rangers uniform makes it appear as though "Turk" merely looks tired from game action. Podnieks story of Sanderson at that time, however, tells a far bleaker story: Sanderson was then destroying himself with drugs and alcohol , and his playing career was coming to an end at the time the photo was taken, thus shedding light on Sanderson's haggard appearence. There are tales concerning the big name stars like Orr, Howe, and Gretzky, but some of the most interesting those like Walt McKechnie's trade history (11 times); Garry Unger's Iron Man streak (over 902 games); Lloyd Gilmour's stories of officiating in the NHL (particularly during the infamous Flyers-Red Army Super Series game of 1976), and the circumstances that ended Rick Martin's career (the Sabres believed he was faking what turned out to be a serious knee injury). All in all, this book is more than just a collection of hockey photographs. It's the work of a truely forward thinking photographer who, sadly, left the game in part because the league didn't know how to market his amazing work. Fortunately, the Hockey Hall of Fame, who issued this book, has done Portnoy and his work a great service. This book not only captures a hockey era, but continues to dazzle with the breathtaking work revealed within.